Security Offerings • Innovative Network Computer Solutions, Inc.
Encryption in action from Sophos on Vimeo. INCS helps companies identify and eliminate vulnerabilities in their network and defend against potential security threats. We design a plan to protect your network resources and respond quickly to breaches (if they do happen), eliminating/minimizing damage and helping you recover quickly. We leverage multi-layered scanning systems in order to provide the maximum level of security without compromising performance. INCS provides remote security services via phone, remote desktop and/or our remote management suite. Of course, if you need on-site support for an IT emergency, INCS will be there as fast as we can without flashing red lights and sirens. Our INCS Firewall and Gateway Network Scanning can resolve most vulnerabilities at the point where your company’s network connects to the Internet. It includes email proxy scanning, web proxy scanning and network security scanning. Email proxy scanning looks for viruses and blocks spam. Web proxy scanning searches web content for mischievous code and so it cannot infect your company’s connected systems. The network security scan protects the network from unauthorized outside access, and attacks from the web. Many industries are required to achieve federally-mandated minimum standards for security. 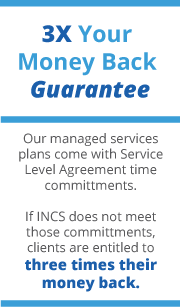 INCS has a proven track-record with HIPAA, PCI and FINRA compliance requirements. We are committed to helping our clients maintain their information security effectively and efficiently.